A stretch of sand called "A Cabio" is apparently A Pobra do Caraminal best known beach and has an EU quality flag. Other local beaches are, "A Corna" and "O Areal" which are close to the town centre and "A Lomina" which is a bit further away. bit further away. All are said to be pretty good. 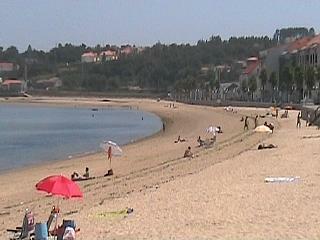 The beach that we saw was located just beyond A Pobra do Caraminal’s port and ran adjacent to much of the town. Unfortunately, we did not identify it by name at the time, but it had a few beach facing bars and a footpath running alongside. It also curved appealingly around A Pobra’s bay and had a yellow and very fine texture to the sand. Above and below, the main beach next to the town of A Pobra do Caraminal. The second shot shows the walk way that runs along side of the beach. Our main view of this beach came shortly before we departed A Pobra do Caraminal. We had finished looking around and wondered down to the edge of town to find somewhere for a cool drink. The bar we found was only metres from the sand and gave us a great view of the harbour to the left, the beach to the right and open sea directly in front. The best places to visit are always those about which you no little, or have few, if any, expectations. For us, A Pobra do Caraminal definitely slipped nicely in to both of those categories and we were duly impressed. A Pobra was clean, in fact it was spotless when we were there. It is easily explored, both in terms of its size and its level of elevation. It has a superb alameda and an attractive port offering a glimpse in to a genuine fishing lifestyle plus a view of the boats owned by the wealthy. 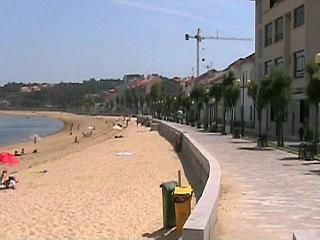 A Pobra do Caraminal has plenty of bars and eateries and the large beach that we saw was clean and enticing. All told, if you plan to take a drive along the coast of the "ria de Arousa", then A Pobra do Caraminal is a stop off you should definitely make. Finally, a closing photo showing an unusual two dimensional bust of what we assume to be a famous local citizen! 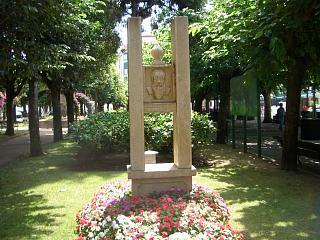 The location was the gardened section of A Pobra do Caraminal's alameda.